So ive been into aquariums for nearly 20 years but salt water i just got into maybe a month ago or less.. My tank already has fish corsl and a neon green lookimg bubble tip anemone.. And yes the tank is cy led i used a gallon of nitrying bacteria so dont ask im not an idiot lol. I habe a koralia power head like im sure alot of you probably have.. And i wondered if an anemone can get sucked into it. Sure enough after looking it up i saw the many wonderfull videos of a anemone floating by and then getting pulled in like a tree shedder. So i put some blue filter floss over it and within 2 days flow in the tank was 30% of what it used to be. So i started thinking.. If filter floss gets clogged fast then foam will get clogged faster and there isnt really anything else i can think of. I remembered i have some plastic anti cat window screen material left over from when i did my screens in the house. 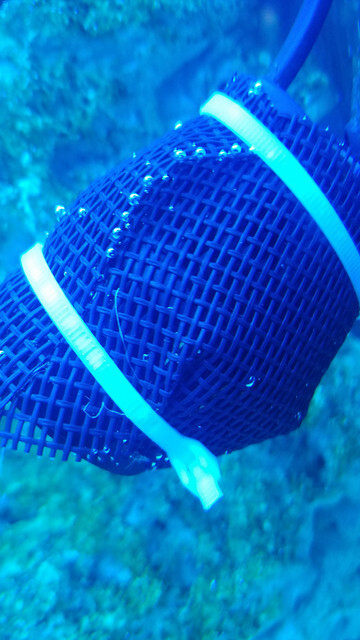 Im sure some of you use it as a top to keep fish from jumping out if the tank. Why cant that be used as a protector for the powerheads ? 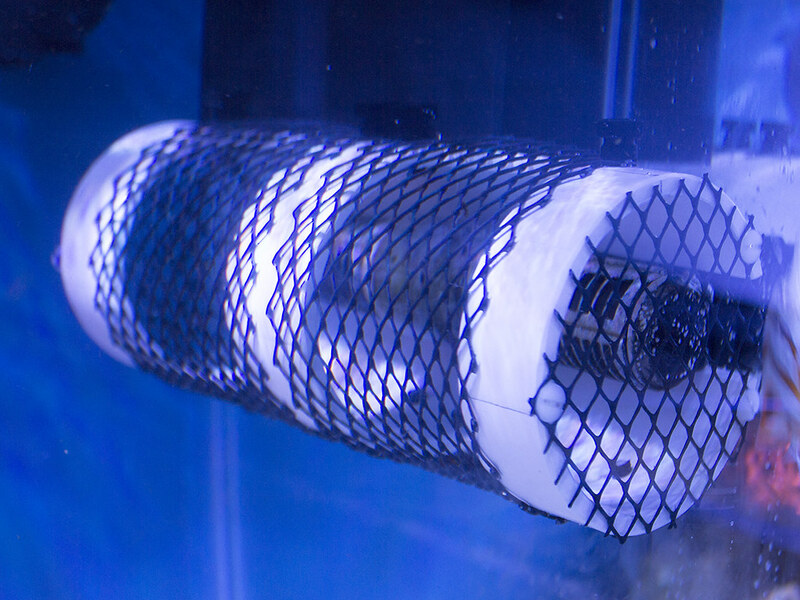 Its small enough to keep them out but big enough to allow flow and not get clogged up from every particle in the tank. I wrapped it around my power head and use two zip ties.. Ill probly get black ones.. But for now.. It works.. Flow is strong and i dont see an anemone getting sucked into that. I think that is still going to get clogged fairly quickly and you’ll have to cut the zip ties every time you have to clean it. I’m not sure how strong that pump is, but for most that are strong enough for a reef tank that screen wouldn’t prevent an anemone from getting sucked into it. It may help in causing less damage to the anemone though. Nice effort. If the mesh is durable, you can take it out to the back yard and spray it weekly. the impellers get dirty and gummed up and need to be cleaned. Its going to be more of a pain and troublesome everytime you need to break the powerhead down. what you will see on the outside of your screening doesnt determine that underneath things are problematic. Coraline algae will also form on this closing up the openings further. foam ones are a pain yes but you can take them off easily and rinse them out in about 10 minutes. in that time doubtful the anemone will go into the powerhead. Grand idea. I love it. Use your own methods that suits your purpose and see if it proves to be fail-proof. I am going to keep this idea in mind for my anemone tank. Grand idea. I love it. Use your own methods that suit your purpose and see if it proves to be fail-proof. I am going to keep this idea in mind for my anemone tank. Okay but why are you dissmissing my idea.. would you rather clean a foam pad every 1-2 days or clean this every few weeks month ? Im confused here. And how is this a pain to remove.. Get a knife cut zip ties remove.. clean wrap zip tie and done..
Maybe because i work on cars and weld for a living i dont find this hard to do but i guess for most people the effort of taking a swiss army knife and cutting a zip tie every few weeks over pulling a foam pad off every damn day is too hard. Last edited by candymancan; 10/16/2018 at 05:01 AM. I have an idea also ...its for gyre pumps..I'm going to glue pieces of jagged eggrate all around the gyre to the glass..any nems will avoid it's jagged edge and steer clear...I'll have to post a pic when I get it done...been thinking about it for a while...gonna use black eggcrate so it's less visible. There's a guy on FB who sells 3D printed covers. He makes then for MP series powerheads as well as a couple of others. So far, his is the best design I've seen because it keeps the nem far enough away from the powerhead to do damage. Any design that simply wraps a material directly over the powerhead usually doesn't work because if the powerhead is strong enough to keep the nem on the powerhead, it can kill the nem. Plus, there's always a balance between aesthetics, ease of use (in this case cleaning), and effectiveness. Im a commercial plumber by trade, I have had tanks and let me tell you right now its fresh and exciting. 12 years later tank maintenance become tiresome and annoying as time goes on. Cutting zip ties every once and a while and rewrapping it will become an annoyance. Im looking out for you in the long run, the foam is a quick simple fix opposed to having to pull the entire pump out and break down. No need to get so defensive about your idea. Ive never covered a pump in my life and had a clown harem/bta tank. As a welder you should know your vaule in time....just trying to help you out brother. I've kept BTAs for a few years now and in my experience, they don't move around too much. But I've always covered my wavemaker just in case. I routinely go for weeks before cleaning the sponge around my wavemaker. Try stopping your pump while feeding and see if that helps. the bta/nem can hug it all day. no issue what so ever, the first couple of months i clean it once a month, since everything is new still leach out po4. after that, i havent clean it for more than 4 months now. still look the same as 4 months ago.